No one needs a reminder of the cost to taxpayers and consumers for health care each year, both here in the United States and abroad. Legislators and taxpayers are also concerned about the return on investment in health care research, and whether this investment is furthering or even hindering the effort to achieve 3 objectives that are frequently in conflict with each other: improving quality, access, and cost-effectiveness. “Research-to-program” gaps, which exist when research evidence is not adequately or appropriately considered and integrated in the development of health outcomes. “Research-to-policy” gaps, which exist when research evidence is not adequately or appropriately considered and integrated in the development of health policy. Implementation science is the study of methods to promote the integration of research findings and evidence into health care policy and practice. It seeks to understand the behavior of health care professionals and other stakeholders as a key variable in the sustainable uptake, adoption, and implementation of evidence-based practice. It also examines system issues for barriers to implementation and new methods to overcome these. A newer component of this science is starting to focus on deimplementation, the discontinuance of things proven not to be effective or safe. JAMA Pediatrics will devote an entire issue in spring 2015 to implementation science research in child health, both in the United States and abroad, in high-resource as well as low- and middle-resource countries. As pediatric care becomes increasingly focused on children, adolescents, and young adults with chronic illness, who account for the largest part of our health care expenditures, our hospital beds, and our specialty care, implementation research for these children and adolescents is of particular interest. Research on how to implement evidence-based practice is needed at all levels of care: the intensive care unit, the emergency department, the wards, the clinic, the home, and sites in the community including schools and neighborhoods. Implementation can be in all forms: from practice to policy. We are interested in rigorous studies that test hypotheses about methods to close these gaps, to translate research in those steps between efficacy trials and population health. This will include randomized clinical trials including cluster randomized clinical trials, adaptive research designs, carefully conducted time series analyses, longitudinal studies, interrupted time series, and qualitative research. We are interested as well in cost-effectiveness analyses and systematic reviews on the most effective strategies to change professional behavior; create informed, activated consumers; and guide the behavior of administrators and health care organizations and policy makers. Manuscripts submitted before October 2014 will have the best chance of acceptance. Full details on submission and author guidelines are available at http://archpedi.jamanetwork.com. Corresponding Author: Frederick P. Rivara, MD, MPH, University of Washington, The Child Health Institute, JAMA Pediatrics, 6200 NE 74th St, 120B, Seattle, WA 98115-8160 (fpr@u.washington.edu). 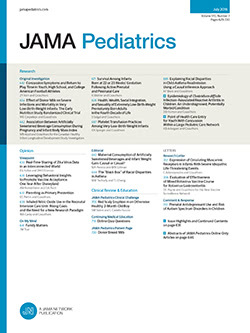 Published Online: June 9, 2014. doi:10.1001/jamapediatrics.2014.976.